If the Rangers want to celebrate a series win, here’s what they need to do to take down the Pittsburgh Penguins in the first round of the playoffs. Photo courtesy of MSG Photos. With the home ice advantage, many people are expecting the President’s Trophy winning Rangers to come away with an easy series win over Pittsburgh. But like Sidney Crosby said, it doesn’t matter how a team gets in. Once they’re in the playoffs, anything can happen. For the first time in a while, the Penguins are coming into the playoffs as underdogs. If they embrace that mentality, using the lower amount of pressure to motive them, and Crosby and Malkin can explode offensively, it will be an interesting series. But with a ton of injuries on the backend, not a lot of depth scoring, and question marks coming into game one, there is a big opportunity for the Rangers to pounce on a fragile Penguins team and advance to the second round. This is what the Rangers need to in order to do defeat the Pittsburgh Penguins. 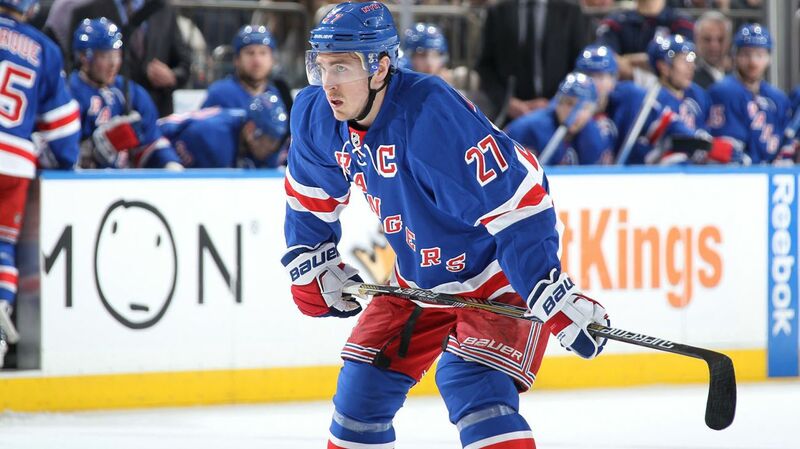 Captain Ryan McDonagh will be one of the key components in shutting down Sidney Crosby and Evgeni Malkin. Photo courtesy of MSG Photos. This is quite an obvious objective. Sidney Crosby and Evgeni Malkin are two of the elite level offensive talents in the NHL. Crosby has everyone’s attention as one of the best players in the game, but Malkin can really be the X-factor in a series. Malkin is capable of taking over a game whenever he wants, and can score at will. But once you get past Crosby and Malkin, there is not a lot of other players that really stand out. Patric Hornqvist could be a scoring threat, but the rest of the lineup has been streaky. Chris Kunitz had a down year, and although Brandon Sutter reached the 20 goal plateau, he was very streaky throughout the season. What the Rangers need to do is focus on taking Crosby and Malkin completely out of the game. The Rangers did a great job of this in last year’s playoff series, holding Crosby to just one goal over the seven games. Scoring was the Penguins’ biggest issue last season, with the Rangers holding them to just three goals in the last three games of the series as they completed their comeback. Alain Vigneault needs to approach this the same way that the team approached the Capitals during the season. Whenever Alex Ovechkin was on the ice, Ryan McDonagh and Dan Girardi were on with him. The same needs to be done here. Match your top two defensemen against their top two skaters. If you eliminate Crosby and Malkin from the game, you take out a huge part of the Penguins’ offensive game. Keith Yandle will need to continue to fire pucks on net in an attempt to rattle Fleury and force him to make saves, something he’s struggled to do in the postseason throughout his career. Photo courtesy of MSG Photos. Marc-Andre Fleury had a solid season this year. Although the Penguins struggled over the last couple weeks of the season, Fleury stood tall in net, and was a big reason that Pittsburgh even made the playoffs. But Fleury is perhaps the most criticized Stanley Cup winning goalie there is. His track record in the postseason over the last few years is not all that strong, and he always finds himself as a question mark when the Penguins are in the playoffs. What the Rangers need to do is just throw a lot of pucks at Fleury. New York has defensemen like Keith Yandle, Dan Boyle, and Ryan McDonagh to line up slap shots from the points, and the big bodies of Rick Nash, Chris Kreider, and Kevin Hayes to collect the rebounds. The more shots on goal the Rangers get, the more likely they are to get lucky bounces and dirty goals, as well as diminish the confidence of Fleury. Fleury relies heavily on his athleticism and his reaction, not playing deep in the net and positioning like Henrik Lundqvist does. Steve Valiquette pointed out that Fleury does not have a strong high blocker side, so the Rangers should target that area. The key here is to pepper the net with shots. If they get some bounces and dirty goals early in the series, and take advantage of Fleury’s style of play, they can get him to start question himself, and start to take over the series. 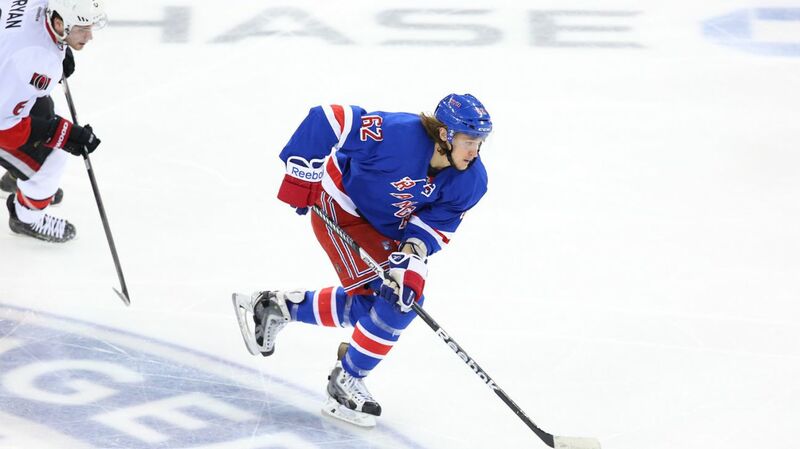 the speed of Carl Hagelin could prove to be too much to handle for a depleted Penguins’ defense. Photo courtesy of MSG Photos. Whenever you ask an opposing coach about what they look out for when facing the Rangers, it’s their speed. Alain Vigneault’s style of play is able to balance a strong defensive effort with quick transition, breakout plays, and zone to zone passes. Very few teams rival the Rangers speed and pace of play, and it’s one of the team’s biggest strengths. As a result of the speed, very often do Rangers fans see Chris Kreider or Rick Nash get a breakaway chance, and 2-on-1 chances are also common place. Even the best of teams sometimes have a hard time keeping up with the Rangers. The Penguins are going to start the series without Kris Letang, Olli Maata and Christian Erhoff. Letang and Maata are out for the year, and Ehrhoff’s status is questionable. Combine that with losing Brooks Orpik in this past offseason, and the Penguins are paper thin on defense. With salary cap restrictions lifted, Pittsburgh can recall some of their reserves from the AHL, but is that enough to contain the Rangers’ speed? New York needs to start each game strong, establish their style of play, and attempt to wreak havoc on the Penguins fragile defensive core with guys like Chris Krieder, Rick Nash and Carl Hagelin. The Rangers power play must step up against Pittsburgh, and the penalty kill must remain strong too. Photo courtesy of MSG Photos. Pittsburgh has always been a team that is strong on the power play. Even without Kris Letang at the point, Crosby and Malkin will still cause problems on the man advantage. The Rangers penalty kill, which has been good lately, will have to remain strong. New York is 27-30 (90.0%) on the penalty kill in the last 12 games, and they haven’t given up a power play goal in nine of those 12 games. Over the last 16 games, they’re 36-40 (90.0%), 46-51 (90.2%) in the last 19 games, and 53-59 (89.8%) over the last 19 games. Needless to say, the Rangers have been really effective killing off penalties, and finished sixth in the league with an 84.3% kill rate. But the Penguins have been just as good, finishing third in the league with an 84.8% kill rate. The Rangers power play has struggled down the stretch, but Derick Brassard scored on the man advantage in Washington to carry some momentum into the playoffs. While teams have won the cup with a struggling power play, it isn’t ideal. Special teams will be very important in this series. This is the series where Glass needs to be very physical. The Penguins get easily agitated, and playing aggressively could throw them off of their game. Photo courtesy of MSG Photos. Now call me crazy, but this is a series where Tanner Glass can have a huge impact. The easiest way to throw the Penguins off of their game is by being physical. The best example of this is Pittsburgh’s 4-1 loss to the Flyers on April 5th. The Flyers came out aggressive, finishing checks, getting into it after the whistle, and just agitating the Penguins. For some reason, it really rattled them, causing them to take penalties, retaliate, and focus more on the Flyers actions rather than the game at hand. 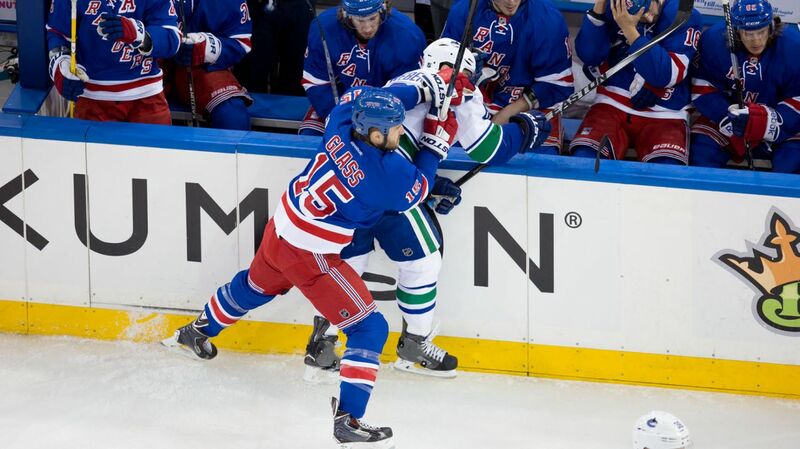 This is where guys like Tanner Glass and Dan Girardi need to come in and continue their hard hitting style of play. Glass can get involved with guys like Chris Kunitz and even their star players to get under their skin and throw them off of their game. Simply being physical and playing chippy has already proven to be a bit too much for the Penguins to handle. And that is exactly what certain Rangers need to do throughout the series. I mean a quick start in two different ways. Come out in the first period strong and try to score first, and win the first two games of the series. In the first period of the game against the Capitals, the last game of the season, the Rangers outscored Washington 2-0, continuing their success in the first period. The Rangers outscored opponents 13-4 in the first period over the final eight contests of the season, and outscored opponents 84-54 in first periods throughout the 2014-15 season. When scoring the first goal of the game, the Rangers are 41-6-3 this season. When leading after one period this season, the Rangers are 29-2-3. Scoring the first goal of the game has been a recipe for success for New York this season. Jumping out to an early lead is something the Rangers need to continue to do. By winning the President’s Trophy, the Rangers are guaranteed home ice advantage throughout the entire playoffs, which can potentially be a huge advantage. In years prior, the Blueshirts had a tendency to let series linger longer than necessary, often going to seven games. If they plan on making another long run, the Rangers need to begin to close out series early, and take advantage of their home ice advantage to win the first two games of the series, and put a damper on Pittsburgh’s playoff hopes. Follow @The_RangerZone on Twitter for news, updates, and more content, as well as interacting with the blog. Posted on April 14, 2015, in In the Crease and tagged Alain Vigneault, Alex Ovechkin, Cam Talbot, Carl Hagelin, Chris Kreider, Chris Summers, Dan Boyle, Dan Girardi, Derek Stepan, Derick Brassard, Dominic Moore, Evgeni Malkin, Henrik Lundqvist, James Sheppard, Jesper Fast, JT Miller, Keith Yandle, Kevin Hayes, Kevin Klein, King Henrik, Madison Square Garden, Marc Staal, Marc-Andre Fleury, Martin St. Louis, Mats Zuccarello, Matt Hunwick, MSG, MSL, New York Rangers, NHL, NHL 2014-2015 Season, NHL Playoffs, NY Rangers, NYR, Pittsburgh Penguins, Rangers, Rangers Nation, Rangerstown, Rick Nash, Ryan McDonagh, Sidney Crosby, Stanley Cup Playoffs, Tanner Glass, The Ranger Zone. Bookmark the permalink. 2 Comments. excellent article! totally agree with your points! not only do they need to pepper fluery but he has been a bit exposed on his blocker side and they need to take advantage of it! i also agree with you point about glass! flyers drive the pens nuts with their physical play and malkin does not like getting hit! thought tanner glass had a very good last 25 games of the season and he could be a very big key in this series! Thanks Ken! 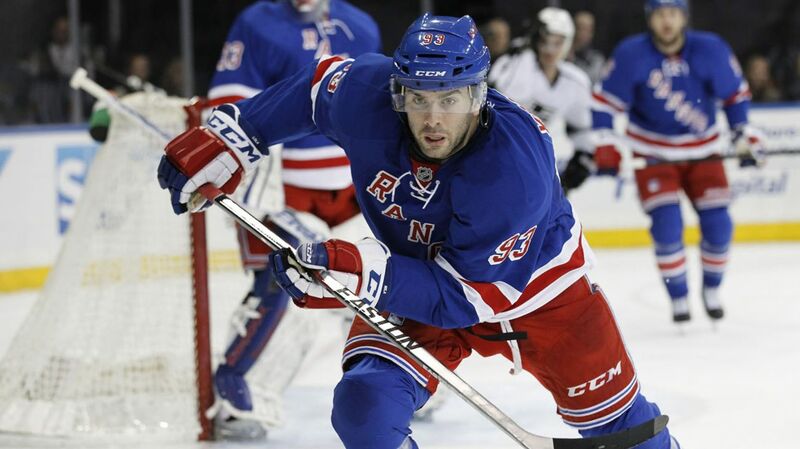 Glass did have a nice end to the season and hopefully him and Girardi are out there hitting hard and causing trouble.